Quality websites at affordable prices. 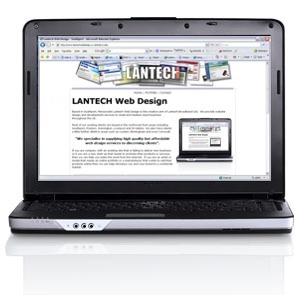 Based in Southport, Lantech Web Design is the creative arm of Lantech Broadband Ltd. We provide professional website design and development services to small and medium sized businesses throughout the UK. "We specialise in supplying high quality but affordable web design services to discerning clients". By combining a love of web design, creative flair and solid technical background we are able to offer a comprehensive web design service which is enhanced by a true understanding of what is required to make a success of your company's online presence. Our web sites and online applications will increase sales by introducing your company to a whole range of new potential clients. We will raise awareness of your brand in both the domestic and global markets as well as assisting you with your digital communication strategy. We will help you understand and maximise the benefit to be had through your use of the internet as a marketing and collaborative media. Select an area of our site by clicking on a section title below. We offer a full web design service to clients throughout the UK. From SEO (Search Engine Optimisation) to Pay Per Click. Whatever you need we are here to help. Let us help you increase your profit by raising productivity. you get precisely what you want and need". Most of our existing web design clients are based in the northwest from areas including Southport, Preston, Warrington, Liverpool and St Helens. We also have clients a little farther afield in areas such as London, Birmingham and even Cornwall. Whatever your location you can rest assured that we will provide you with the website you deserve at a price you will be happy to pay. Call us now for a free no obligation consultation. You'll be suprised how affordable quality web design can be.